“Mom, would you like to volunteer for Challenge Day at Mandarin Middle School in a few weeks?” Joel asked. “I probably would but I would need to know more about it,” I answered. Then my son proceeded to tell me about an initiative at the school he helps sponsor, “Be the Change,” a movement to help students break down walls of isolation and loneliness and replace them with compassion, understanding and love. 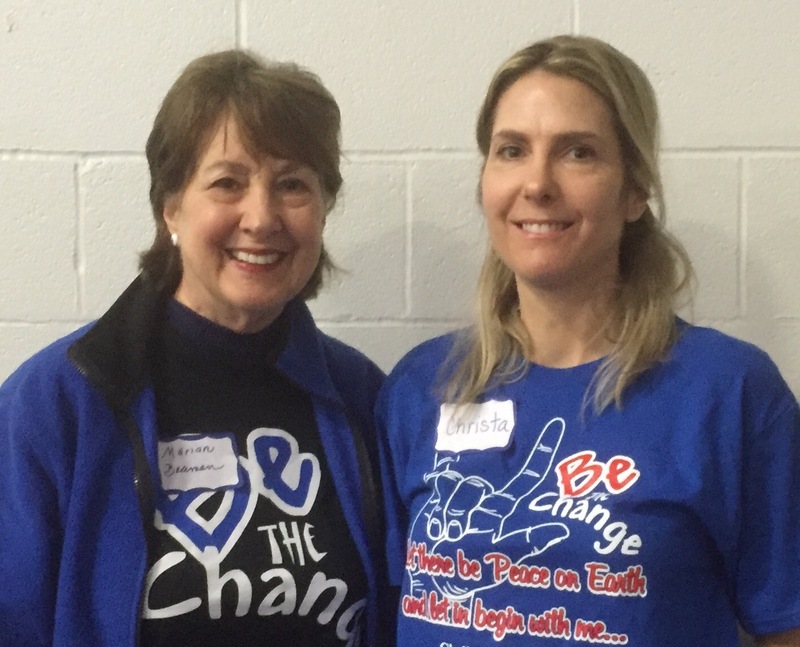 My day of change came on a Tuesday, when student ambassadors greeted me at the door and pointed me to the gym, where I found my daughter Crista, also a volunteer. Seventh and eighth grade students filed in under an arch of welcome, volunteers forming a path of entry with our bridge of arms. Later, we found out students thought doing this was hokey. The facilitators, Chris (a guy) and Trish began with games: “Find 10 people you never met before and give them a high five.” All the students were strangers to me, so that was easy. The day proceeded with other forms of friendly physical contact: fist bumps and eventually hugs. “Now, with your partners, slap the ball to the other side,” students stabbed at a super-sized beach ball to earn points. Music and dance underscored many of the day’s activities: Soul Train, Wildest Dream, Where are You Now? Time of Our Lives . . . .
Then the facilitators turned more serious, referring to parallel lines of blue tape they had previously attached to the gym floor. you have ever been hurt by what someone said about your skin color, religion, or how you dressed. you have been hit, beaten or abused in another way by a parent or other authority figure in your life. someone you know hurts the family because of alcohol or drugs. you have lost someone you loved recently or a long time ago. Emotion was palpable as students and volunteers alike crossed blue lines. Viewing their somber faces, I intuitively felt students’ dawning awareness of similarities in the lives of their friends and classmates. One of the facilitators shared her challenging life story of abuse and neglect. Students sat agape, eyes transfixed as her startling story unfolded. Before lunchtime we were assigned to family groups of 4 or 5, two boys and two girls. With guidance, each was ready to share something heartfelt in my group. My parents fight all the time and I think they might get divorced. I don’t know who my dad is and my mother left. I live with my aunt and cousins. My mom died last summer and then we had to put my dog to sleep. Tears flowed. Each group leader doled out Kleenex tissues. There was share time, with scenes similar to this photo clip from a Challenge Day video in Michigan, which appeared on Oprah’s website. 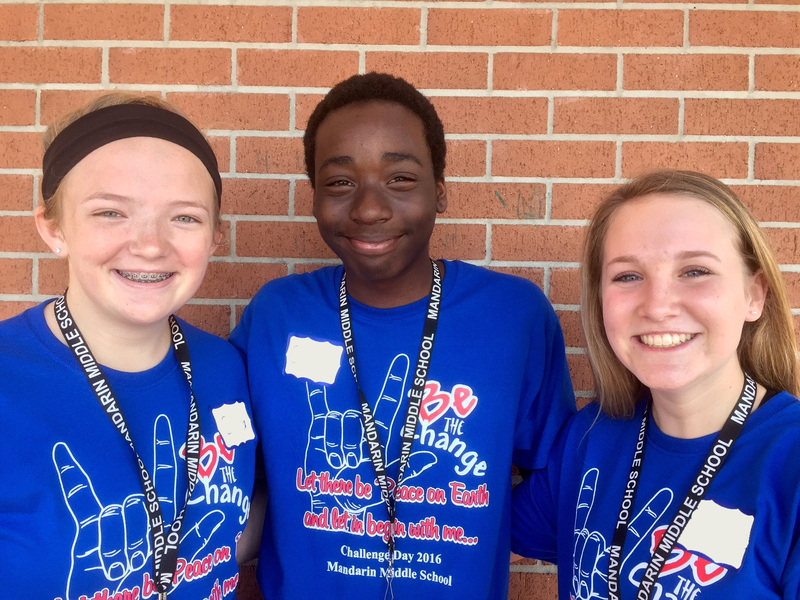 Most of the students who grabbed the microphone at Mandarin Middle confessed to prejudice or bullying and then publicly asked for forgiveness. More hugs and tears. The day closed with students writing a thank you note to express gratitude to a special person in their lives. Most chose their mothers. One girl in my group wrote two notes! Rich and Yvonne Dutra-St. John are co-founders of the innovative Challenge Day program and the Be the Change Movement. Rich is a former high school teacher and championship wrestling coach. Yvonne is a gifted speaker, educator, and program designer. The leadership at Mandarin Middle School, including my son, doesn’t believe this quip. And neither do I. Have you heard of this program or one similar to it? How have you made a change, major or minor, in your life? Coming next: Are You Too Big for Your Pot? Next postAre You Too Big for Your Pot? What a fantastic innovation. It should be a standard in schools the World over. Knowing you a bit through your comments and your life story, I know you heartily approve of hugs. In fact I believe you founded an organization with that gesture of affection as a cornerstone. I wonder whether there is a movement similar to the one I describe here in the British Isles. Huge hugs back to you, Lord David! It sounds like an interesting day! So we both have children who are teachers, and you were kind enough to volunteer (or let yourself be volunteered) for this program. I suspect the quotation was not really something Mark Twain wrote, since you can’t find its source, but I understand the joke. Those Middle School years are tough, but kids at that age are also interesting and interested. There is that herd mentality that can be a problem. (When my husband first started teaching, it was 8th grade math. He had a group of girls who stuck together that he called “the amoebas.”) I heard of one program recently that targeted “the cool kids” to speak out against bullying–the point being that then others would follow them. Yes, I allowed myself to be volunteered even though I know the day would be draining physically and emotionally. But after I got there I realized and then witnessed the potential for change and didn’t regret my choice. Besides willing teachers, there is much that goes on behind the scenes to support this movement. At Joel’s school, several teachers and a strong guidance counselor cohort support Be the Change at Mandarin Middle. In addition, someone at the school board with the title Director of Inclusion and Equity serves as the liaison helping to maintain the program throughout the county. Yes, I do recall reading about your living room re-arrangement in a comment recently – ha! I’ve never heard of this program, Marian, but what a fantastic idea. I agree with David, it should be mandatory in all schools. Thanks for sharing it with us. I love all of the smiling faces! Yes, smiling faces. It would have been interesting to observe the changes in facial expressions and body language through time-lapse photography as the day progressed. It was nothing short of magical. I’m happy to share good news about middle schoolers who often get a bad rap. Thanks, Jill. That’s a wonderful initiative and I hope it will work for those in need of comfort or suffering from prejudice. Good on you for taking part. Living in a foreign land is always difficult and lonely, especially at the beginning, so I know how much prejudice and misunderstanding can hurt, especially when you are on your own. It sounds as though you have your own encounters with bias and unkindness. For that I’m sorry. When walls break down like this, love and understanding can be exposed. I hope you have had some positive experiences too as you travel the world with your husband – and dog! Yes, I have been blessed with kindness and good friends too; it is just upsetting when one meets narrow-minded, ignorant people. If I have a choice, I like to spend less time with negative folks, more time with those that give me positive energy. Like you, I don’t want to feel drained at the end of the day. Thanks for adding to the conversation here, Fatima. Well, a lump in my throat and teary is how I feel right now Marian, thank you. What a fantastic challenge. I’ll say about this at my next meeting at the school where I volunteer. Actually I’ll forward it to our group leader…. it deserves to get out as much as possible so that we can all be the change we want to see. Wonderful, Susan! This program is international, and there may already be an initiative in South Africa. If not, you and the group leader at the school where you volunteer can be agents for change there. Your feedback represents what I hope would happen when I spread the word about this life-changing event. Full speed ahead, Susan! This is where it all starts. Thanks for sharing your knowledge about Challenge Day. As an ExPat American living in Europe, I hadn’t heard of it. We need this program all over the world. Welcome, Patricia. As you can see from the comment above, this program is international in scope, so there is a possibility for movements like this in schools worldwide. Thanks for reading and commenting here. Do stop by again. I found your site through Susan Scott who shared your post on her FB page. Susan is a dear friend whom I treasure deeply. Whenever she shares a post, I know it is well worth my time to read it. I appreciate Susan’s endorsement and your following up here. Shalom to you too, Patricia. Yes, the key thing: Being listened to – and listening to others. Many come from homes where their voices are not heard, or worse, silenced. One of my biggest takeaways was noticing the students dawning of awareness of how others’ suffering was so similar to their own. Thank you for the good wishes and the compliment about Crista. It was a good day, Anita, and life-changing. You and your husband have provided such a solid foundation of love and acceptance in your family. Most children don’t have that! Thanks again for reading and commenting here. What a wonderful opportunity you were offered and seized. 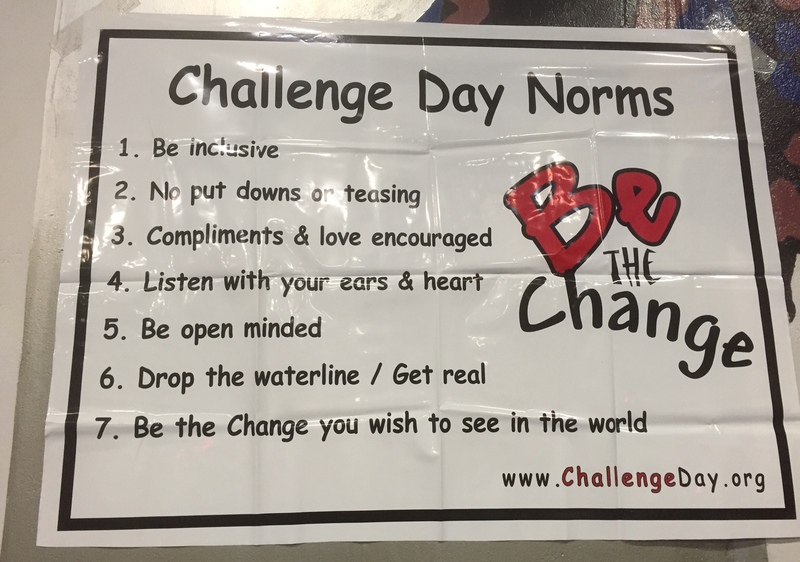 I had heard of Challenge before, our office videotaped part of a Challenge Day in some city (I was not there) as part of a documentary. The details are fuzzy now but I remember thinking then what a wonderful program it was and I’m delighted to see it has grown and appears to be helping thousands. May the change continue! I’m glad you have experienced vicariously the positive effects of this program. I wonder whether the offices at MennoMedia did the videotaping. Yes, this initiative has grown tremendously and now has a global outreach. In a world grown callous to human suffering, it is heartening to realize that the next generation has opportunity for change and growth. Thank you, Melodie! Wow wow wow to all of you for this great program. It us so needed everywhere. This would be so good for our city kids. I strongly believe if we get them young to be sensitive we win half the battle. Looking back to my time in middle school I know I could have benefitted from this program. So wonderful that you volunteered great for the children there and for your own children what a great legacy. I’m going to ask our middle school if we have something like that here. Again thanks for the great post. I considered it a privilege to be part of this program. I had no idea it was such a noble enterprise. Wow! Thanks for noticing, Susan. Marian — Clearly this initiative is positive, uplifting, constructive, and healing; a watershed event for young people that shifts perspectives and changes lives. I’m encouraged just knowing this type of initiative takes place in schools. 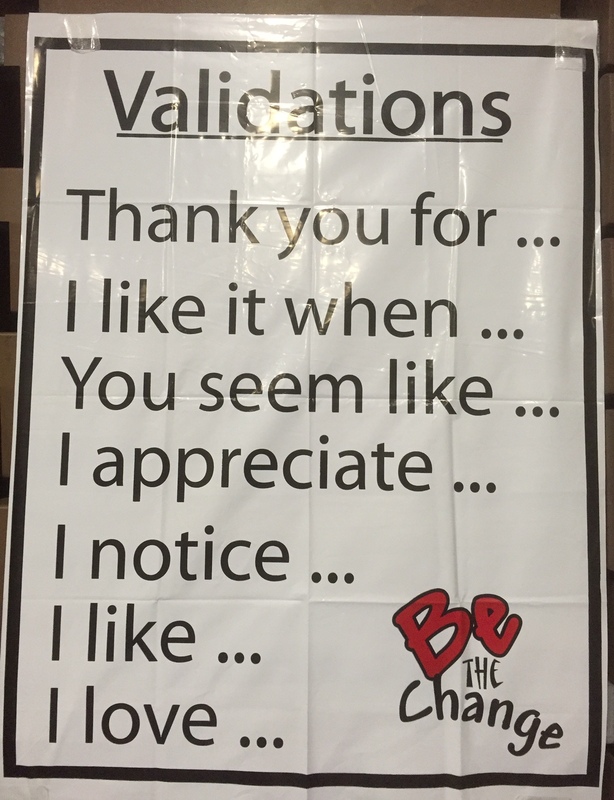 I love the validations poster — a tangible tool the students can weave into their communication style at school, at home, wherever they go. Thank you for participating and sharing your experience here. I appreciate YOU! Seeing is believing. All students came voluntarily, but some signed up because they wanted to get out of class. Boy, did they have an eye-opening experience! I have a grandson who is 15. I wish they would have a day like this at his school. I’m guessing he would be hugely embarrassed by it all, but I think it would still have a very positive impact on his life. Good for you to have spent a day like this with high schoolers! Elfrieda, the facilitators were wise in creating a positive atmosphere through the games we played and the life stories they themselves shared. There was no pressure to participate but the students were swept along on a current of acceptance and goodwill. No one I observed seemed embarrassed at all. We all need more of this in our lives. Thank you for reminding me. This encounter gave me a jolt with a reminder to practice the Golden Rule every day of my life! Thanks for noticing and commenting here, Anna. Aw Marian what a fantastic event to be a part of . I so wish there had been thing s around like this when I was at school. Just to open up to fellow humans almost heals the pain doesn’t it . When I was about thirteen , which was many years ago 😙 , we had a boy start at our school who appeared different . Word got around he lived in a caravan with only his mother , who was labeled ‘strange ‘ . When I think back she probably had mental health problems . Many kids bullied him , as if he needed anything else. So me , big tough Cherry …hardly 😊 Stood up for him . So much so the head master spotted me causing trouble and I was sent to his office to explain myself . I don’t think he ever believed me that I was trying to help the boy but the boy never forgot me . He came into my salon many years later and we talked …remembering our school days …he had become a lovely man I knew he would . I’m glad your internet problems are solved, so you can share this marvelous anecdote. Many bullied kids don’t have stories with a happy ending. I’m glad he sought you out years later and that your wish to help him as a child became a reality in his manhood. Yay, Cherry! Amen, sister! Your comment here and the multiple tweets including yours are sending out positive signals everywhere. Big always starts with something small. I hope all kids get an opportunity like this; goodness knows it’s needed! One day Sage will be a middle-schooler. My two grandsons are already there (sixth grade) and I daily pray for a hedge of protection around them. The students you see here are 7th and 8th graders. Yes, very much needed everywhere! I’m so impressed to see this happen on a school-wide level. My own children had experiences like this at leadership camps and other events that involved a small (and if I’m honest – privileged) group, but it’s really encouraging to see it happen for all people at the same grade level. Compared to your description this event included more students. Still, of a student body of over a thousand only 300 students (all of whom volunteered) benefited. But it’s enough to start a mighty ripple. Thanks for continuing the conversation here, Arlene. I agree with David, Marian. This should be included in schools everywhere. What an excellent “challenge” for this age group…and actually all groups! Last year Jim and I spent the day with our daughter Molly’s 6th and 7th grade special ed students (functional skills; mostly Down’s Syndrome and autism students). We help them ice and decorate dozens of sugar cookies, and then we helped them deliver Thank You messages and cookies around the school (to teachers, aides, help staff, custodians, bus drivers, students, etc.) and use their social skills to specifically thank each one. It taught us as much as it taught them. That’s the crux of it and you said it so well, “It taught us as much as it taught them.” When students practice new social skills they are given dignity and self-esteem. How great that three generations were involved in the event you describe: you, Jim, Molly and her students. Obviously, Molly is cut from the same cloth as her mother and grandmother! My daughter-in-law Sarah is site director for the autism program at a school here in Jacksonville and would heartily applaud this approach. As always, thanks, Marylin. That sounds like something that would be good here too. David, our first commenter also from the UK, expressed the same sentiment. What’s not to like about a positive movement like this? Keep on walking, Marie. And thanks for commenting here. How inspiring, Marion. Thank you for doing this for those who were there and for all of us. Such an opportunity. Such a gift for everyone involved. That moment of stepping over the line brought me to tears. A silent wave of sneakers crossed the line at each prompt, students and volunteers alike. It was a great leveling exercise. No one was ever alone (even remotely so) crossing the line. To my way of thinking, it is just one step from realizing we are not alone to being aware that we are more alike than we are different. Appreciation and understanding result. If we’re lucky, even l-o-v-e! It sounds like an interesting program. I have not heard of it but I have no children in the public schools anymore. I know bullying is a big problem, well it always has been, probably back to the cavemen. But that is the big initiative here, that and understanding diversity. My daughter in law is a counselor in the public school system. I thought of another initiative that is being pushed in the schools is suicide awareness, not being afraid to confide in someone and to look for help when needed. I’m not much for change, can’t think of anything really. We reorganized the sewing room while it is empty. It is also our spare bed room, but is the room too for my husband’s developmentally disabled brother who lives with us 3 months at a time…he moves between siblings. He likes horses. I found a painting at the thrift store and my husband made a frame for it. It was nicely done, of horses running across a field, mountains in the back. I am pretty sure it was a paint by number. Do they still make those kits, I wonder? This year he will be with us for the summer so we are working on a pair of summer pajamas for him with horse patterened fabric. You mentioned suicide awareness. At the end of the day I described on this post, the volunteers along with school staff assembled for a 20-minute debriefing. At that time we were asked to look at our group of 4 students and identify to the guidance department any who seemed desperate or hopeless. I feel confident that someone at the school would address that student’s need immediately. How wonderful your are lovingly making summer pajamas with just the right pattern for your husband’s brother. Right now I’m in PA taking care of similar needs for a family member. They are fortunate and we are blessed in giving attention to those who would otherwise fall through the cracks. Thanks for telling your story here, Athanasia.